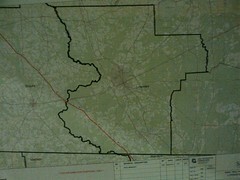 FERC could choose Option B that runs through Valdosta. Sabal Trail had an interactive GIS map of the entire pipeline route in Moultrie last night, with zoom and pan detail as good as the tax assessor maps for Brooks and Lowndes Counties. The Sabal Trail reps declined to provide a copy of the whole GIS, but they obligingly panned down the pipeline and waited while I took pictures with my smartphone.